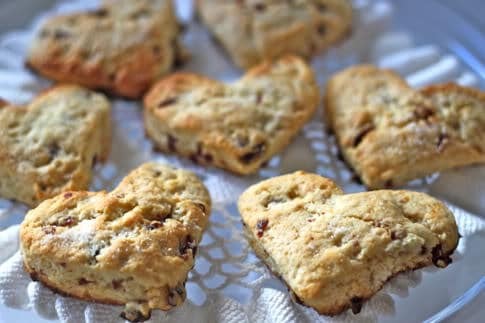 Heart-shaped scones are an easy-peasy Valentines Day breakfast treat (or really an any day, anytime treat). 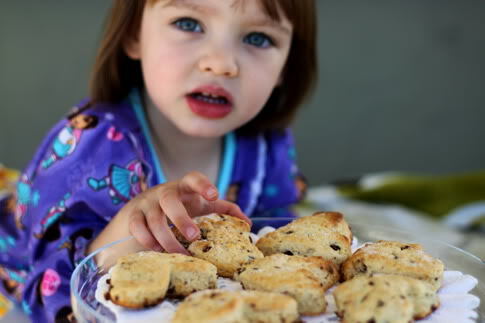 Many Prudent Mamas are obsessed with the recipe Jacinda posted last year for Kevin’s Famous Scones. I used to dislike scones (because I was used to coffee-shop-chain, dry, day-old-biscuit tasting suckers), but these are moist and flavorful, and most of all, EASY. If you are part of our facebook circle of love (join the party at facebook.com/prudentbaby) you know that I made a batch with frozen raspberries last saturday and my husband and child ate EVERY SINGLE ONE before I got to snap a pic or even taste one! …but, my point is, I had to scrounge the cupboards for scone flavors, and I ended up using dried yogurt cranberries and a tangerine from our tree. Super deelish! You can make yours with any filling ingredients, and the heart shape will just make them that much sweeter. The whole thing takes about five minutes to mix together and a bit more to bake, making these scones a simple sweet treat for a lazy morning. THANKS KEVIN! 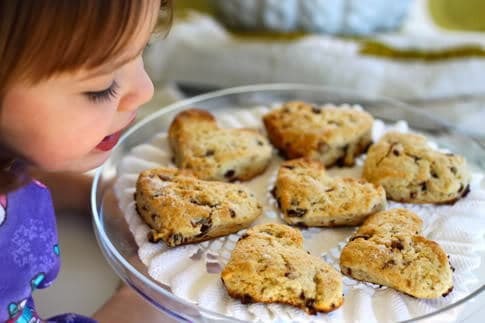 Get the full Scone Sweet Scone recipe after the jump…And tell us if you abhor or adore scones in the comments. Remember that any comment you leave this week could win you some super-sparkly Kreinik thread! Dig into the cupboard and yank out some dried fruits. I wanted dried cranberries, but I only had the yogurt covered kind we pack in school lunches. We call them “candy raisins”, she thinks they’re actual candy (they kind of are though, right?). Anyhoo, chop those up teensy. Also grab a citrus fruit. We have a tangerine tree, so we went with a tangerine. Grate the tangerine peel. I love my microplane grater. Chop the tangerine into delicious looking slices. Take a picture of them. Why is citrus fruit so dang beautiful on the inside? It is, isn’t it? also works. Mix first 4 ingredients. Add butter (cold and chopped into bits) and mix to a meal. Add cream and mix. Add cranberries and tangerine zest & juice and mix. Don’t overmix, that will make them tougher. Just bring all the ingredients together and evenly distribute your yummy add-ins. Now scoop it all together and place onto lightly floured flat surface in a ball. Smoosh the ball down flat until it’s about 3/4″ to 1″ thick. Use a heart cookie cutter (or a round one or square, but anything more complicated won’t hold its shape) to cut out shapes. I had to bend my heart cookie cutter to create a sharper point in the top of the heart, since they spread a bit my first batch just looked like melting heart-circle lumps. You could also just cut into wedges, but not as cute. They’re so cute! Scones are best eaten the same day, so in the extremely unlikely off-chance that they won’t all be eaten today, freeze some of them at this point. Freeze them by putting them on a baking sheet in the freezer, then, when frozen, take them out and put in a ziploc bag and return to the freezer until you are ready to eat them. At that point bake them, adding 3-4 minutes to the baking time. Sprinkle with more sugar. Place on baking sheet. Bake in 425 degree oven for 15-17 minutes. Closer to 15 for me. Rotate halfway through cooking if you want to avoid the browning you see on my hearts. They taste superyum either way, but if you want perfectly distributed color, rotate. Remove them when they are just starting to brown or even a second before if you can figure that business out. Cute baby-hand grabbing heart-shaped food! gah! She loved, ate several. The best part is packing one in her lunch so she can feel the love at school too. I love making scones. You are right, when you have a good recipe they are super easy and delicious! Love the heart shaped idea. Your flavor combination sounds great though! The scones look great! Can't wait to make them once we are done with this horrible no-milk diet. yummy! I am making these for sure! QUESTION…..I have been making your hot pocket dough like a mad woman and filling it with all dorts of goodies….creamed spinach, broccoli and cheese, ham and cheese…yum! But I am thinking it would be great if I could make them and freeze them….like real hot pockets, to bake later. Have you tried freezing it? Good…bad? I love scones! I make a killer white chocolate raspberry. Thanks for sharing yours. Awesome. Thanks for an easy recipe. I am not normally a scone kinda girl. I mean if I'm going to be eating that many carbs I'll just take a cookie thank you very much. Or a slice of cake. But I think these will be a nice breakfast treat for my 3 lovely ladies on V-day. thanks ladies! ashley, yes i have frozen the hot pockets – i just assemble them, flash freeze them on a plate in the freezer, then when they are fully frozen I put them in a ziploc bag, then whip on out and bake for an extra 2-3 minutes. We like scones… Actually, if it is sweet and can be eaten, it is, more than likely going to be gone from our house within moments!!!! Will have to try your recipe, and the trick of cutting them in funky shapes! I will try this recipe today. I like to make heart-shaped baking powder biscuits, too! Thank you for your wonderful blog. so sweet. love the pic of your girl sniffing in the fresh baked smell. MmmMMMMm!! Made some strawberry scones this morning, and they are DELISH!!! Added a splash of vanilla and that made it a perfect recipe! It's a keeper! finally caved and made my first batch of scones today. This post pushed me over the edge. Baking now. Fingers crossed that dark chocolate, dried blueberries and chopped pecans are a good combo. I saw these this morning and made them right away – they were FANTASTIC! I made blueberry/lemon zest – yummy! I had some friends over, and between the four of us, we devoured them all. Delicious and simple! I made blueberry lemon too and they were awesome!! I don't keep heavy cream on hand so googled for substitute. They turned out perfectly. Will definitely make again. Thanks for sharing and inspiration. I made them last night! Yes, I did. I had fresh blueberries and lemon peel. I'll probably make more tonight as my parents want to try some as well. We love scones! I use dried fruit like cherries and blueberries and they plump up so nice in the oven!!! I just made these tonight. I had to alter the recipe a bit to make them dairy-free but they were still delish. Thanks for the great recipe! uhhh. how am i supposed to mix COLD butter and the first four ingredients to a meal? they all stick to the butter. and then thats it. I chop the butter up if I'm doing it "old school" (i.e. by hand). It doesn't have to be all that even of a mix. What a great recipe! I love that you cut them into heart shapes. I am having a link party this week featuring breakfast recipes that you can make with food you already have in your food storage. I would love it if you would link this recipe up. i just tried the recipe using what i had at home. I chopped prunes and used evap milk. Didn't have any citrus. I let it bake until the edges got a little brown and crispy – my 3 yr old loves it! These look SO yummy! I just put some in the oven but I used dried cranberries and lemon with lemon zest. Also added a small handful of pecans. I hope they turn out as yummy as yours look! Thanks for the great recipe!! !